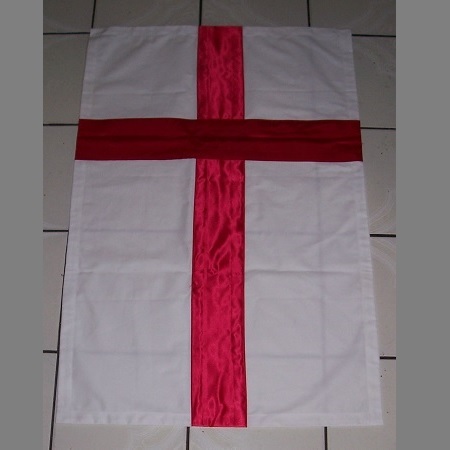 Pure white cloth with appliqued cross in red satin. Measures approximately 24 inches wide and 36 inches long. 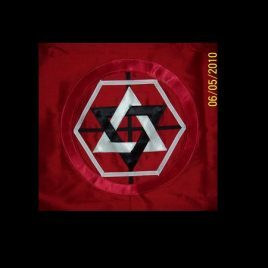 This Operational Cloth is made from a piece of red silk measuring approximately 25 inches square. The traditional Martinist pantacle measuring approximately 8 1/4 inches in diameter adorns the center. The perfect floorcloth for your operations. 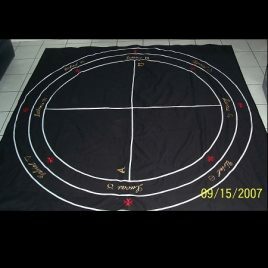 Outer circle measures a full 6' diameter. This piece is a complex combination of applique and embroidery. The lines and circles a painstakingly placed and stitched. Then a series of 18 separate embroideries are required to complete the piece. The photo barely does it justice. Allow 6 to 8 weeks for this item to be made for you. 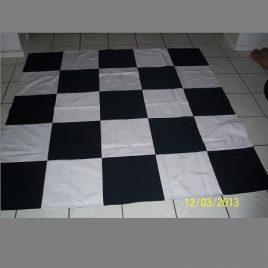 Black and white checkerboard floorcloth to adorn the center of your Temple space. Choose from several sizes. Allow 3 to 4 weeks for this item to be made for you. 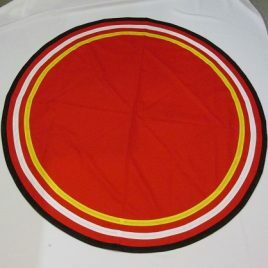 Red circular floorcloth with successive rings of black, red, white, red, and yellow. Measures approximately 48 inches in diameter.